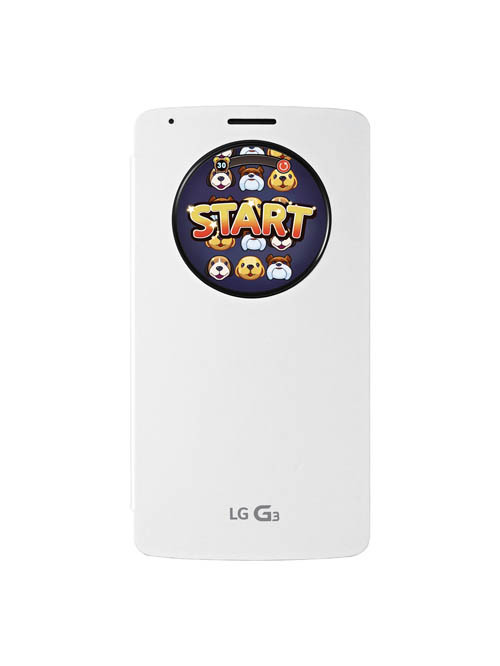 Proving that QuickCircle can be as much about fun as function, LG Electronics today introduced the world’s first mobile game developed exclusively for its windowed LG G3 case. Now in addition to being able to check the time, place calls and take photos without opening the cover, LG G3 owners with the QuickCircle Case can now have a bit of fun on-the-go with a free game, Puppy Pop. Puppy Pop is a match-three puzzle game developed by LG specifically for the G3 with QuickCircle Case to be played through the open window on the cover. Players accumulate points by drawing lines through three or more identical puppies, removing as many from the board before time runs out. Scores can then be shared on the player’s favorite social network site. A fun and unique way to experience the QuickCircle Case, Puppy Pop also represents LG’s continuing effort to develop mobile content that enhances the functionality of its products. Puppy Pop is an example of the versatility and flexibility of the LG QCircle software development kit (SDK) available at developer.lge.com for developers to create new applications and functions for the QuickCircle Case. Puppy Pop will be free to download from Google Play Store (play.google.com) starting on July 23.